If you are a serious athlete or a hard-core fitness enthusiast, managing your nutrition for optimal performance can seem tricky. Post-exercise nutrition is particularly important to replenish fluids, electrolytes and glucose that were depleted during your workout. But you don't have to go to great lengths to concoct the perfect post-workout meal. Juicy, delicious watermelon has everything you need to refuel, plus performance-enhancing benefits that will improve your overall health and fitness in the long run. During both aerobic and anaerobic exercise, your muscle cells rely heavily on glycogen, the storage form of carbohydrates in your muscles and liver. Consuming watermelon shortly after your workout can help replenish depleted glycogen stores, refueling your muscles for your next workout. According to a U.S. Sports Academy article by Gregory Tardie, PhD, there is a two-hour window after exercise that is optimal for carbohydrate replenishment, after which glycogen synthesis slows to about 2 percent per hour. However, Tardie suggests that consuming 50 g of carbohydrate every two hours after intense exercise raises the rate of replenishment to 5 percent per hour. Four cups of watermelon contain about 50 g of carbohydrate, perfect for post-exercise glycogen replenishment. During exercise, your body loses water through perspiration and respiration. Restoring your fluid balance is essential for your body's systems. 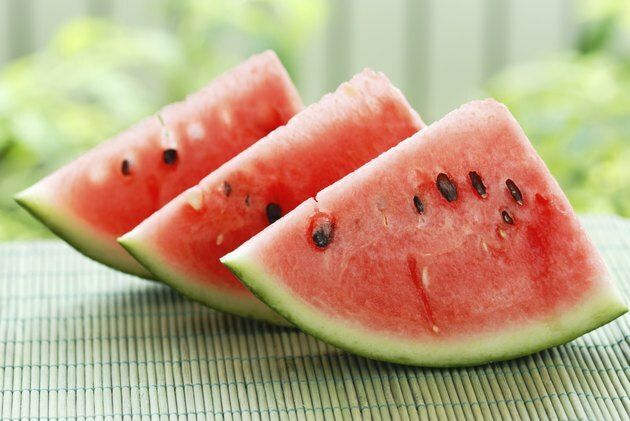 Watermelon's high water content makes it a natural thirst-quencher and fluid replenisher after exercise. What's more, watermelon contains important electrolytes essential for nerve function and heart health that become depleted through perspiration. A 2007 USDA study published in the "Journal of Nutrition" found that healthy subjects ages 36 to 69 who consumed 1,500 g of watermelon juice daily for three weeks significantly increased available levels of the amino acid L-arginine, important for blood vessel health and joint function. L-arginine has also been shown to boost athletic performance. In a 2010 study published in the August 2010 issue of the "Journal of Applied Physiology," researchers found that arginine increased exercise tolerance and performance in healthy men, enabling them to work out harder with less energy expenditure. Watermelon has been shown to lower resting blood pressure. In a 2010 study published in the "American Journal of Hypertension," Florida State University researchers Arturo Figueroa and Bahram Arjmandi administered daily doses of L-citrulline/L-arginine extracted from watermelon to prehypertensive subjects in their 50s over a six-week period. Their findings revealed that all subjects showed improved arterial function and lower blood pressure. Because the arteries play an important role in oxygen delivery during exercise, consuming watermelon after exercise can enhance aerobic cellular function during future workouts. United States Sports Academy; The Sport Journal; Glycogen Replenishment After Exhaustive Exercise; Gregory Tardie, Ph.D. Nutrition Express; L-Arginine Boosts Exercise Performance; Jeff S. Volek, Ph.D., R.D. Is Watermelon Good for Losing Weight?